Male (left) and female of Tychus niger, copyright Lech Borowiec. Another brief beetle post for today. 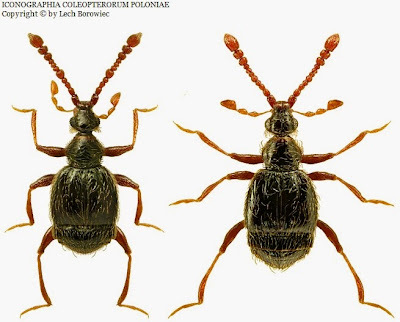 The species in the image above is the type species of Tychus, a genus of about 150 species of pselaphine beetles found in Eurasia and North America. Chandler (1988) regarded the North American species as a separate genus Hesperotychus but Kurbatov & Sabella (2008) felt that the differences between species from the two continents were not enough to warrant separation. There's probably still some work to be done here. Like many other pselaphines, most of the work on Tychus has focused on the morphology of the various species, with relatively little having been said about its life habits. Heer (1841) described the habitat of T. niger as 'sub lapidibus et in graminosis' which I believe means 'under stones and among grass', and Kurbatov & Sabella (2008) recorded collecting a specimen of Atychodea pilicollis, a related species, in damp sand. The large, broad-ended palps (the appendages on the head behind the antennae) of Tychus species suggests that they are probably micropredators, like the pselaphine Bryaxis puncticollis whose hunting behaviour was described in an earlier post. Like most pselaphines, the small size of Tychus species means that they generally escape observation. Tychus is the largest genus in the pselaphine tribe Tychini. Tychins are most diverse in the Holarctic region, with only a very few species found in southern and south-east Asia. Chandler (1988) characterised the Tychini by the shape of the third segment of the palp, which is invariably longer than wide, and by the antennae usually being inserted close together on a narrow rostrum, though this varies a lot in distinctiveness between species. Kurbatov & Sabella (2008) also identified a number of other features representing possible synapomorphies of the Tychini, and suggested that the Oriental genera Atychodea and Amorphodea represent the sister taxon of the remaining Holarctic genera. The genera of Tychini are all fairly similar in appearance; notable distinguishing features of Tychus include an asymmetrical aedeagus (the intromittent organ in the male genitalia) and the arrangement of foveae (hollows) on the elytra and sternites. Males of Tychus often have one of the antennal segments modified as in the male of T. niger shown above, with a median segment noticeably thicker and broader than those on either side. The purpose of this enlarged segment, as with so many other features of pselaphines, seems to be unknown. Chandler, D. S. 1988. 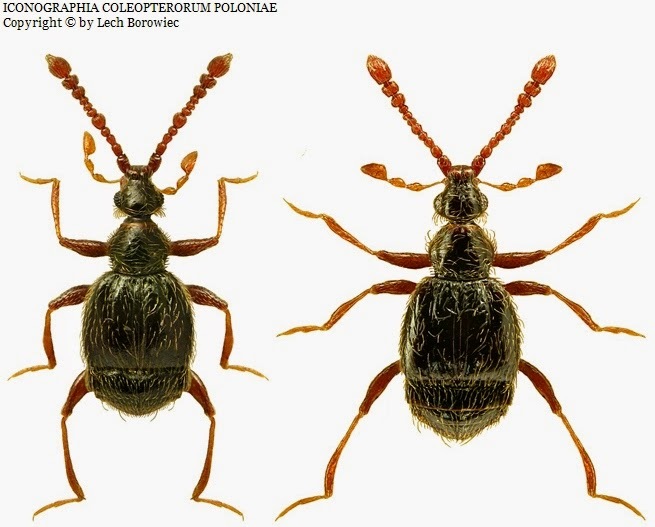 A cladistic analysis of the world genera of Tychini (Coleoptera: Pselaphidae). Transactions of the American Entomological Society 114 (2): 147-165. Heer, O. 1841. Fauna Coleopterorum Helvetica, pars 1. Impensis Orelii, Fuesslini et Sociorum: Turici. Kurbatov, S. A., & G. Sabella. 2008. Revision of the genus Atychodea Reitter with a consideration of the relationships in the tribe Tychini (Coleoptera, Staphylinidae, Pselaphinae). Transactions of the American Entomological Society 134 (1-2): 23-68.